DefectDojo is a security program and vulnerability management tool. 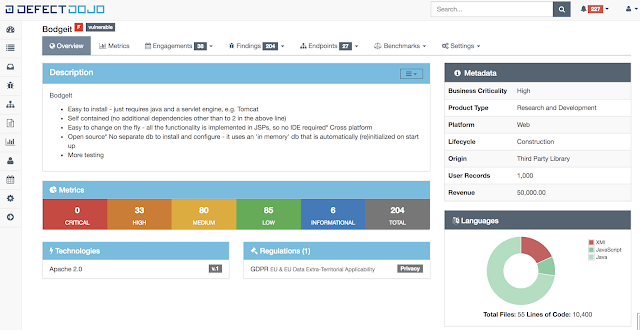 DefectDojo allows you to manage your application security program, maintain product and application information, schedule scans, triage vulnerabilities and push findings into defect trackers. Consolidate your findings into one source of truth with DefectDojo. Try out DefectDojo in the testing environment with the following credentials. We recommend checking out the about document to learn the terminology of DefectDojo and the getting started guide for setting up a new installation. We've also created some example workflows that should give you an idea of how to use DefectDojo for your own team. Realtime discussion is done in the OWASP Slack Channel, #defectdojo. Get Access. DefectDojo Twitter Account tweets project updates and changes. Charles Neill (@ccneill) – Charles served as a DefectDojo Maintainer for years and wrote some of Dojo's core functionality. Jay Paz (@jjpaz) – Jay was a DefectDojo maintainer for years. He performed Dojo's first UI overhaul, optomized code structure/features, and added numerous enhancements.